At one time, New Ross in Co Wexford, had a large number of churches and meeting streets scattered through its streets. 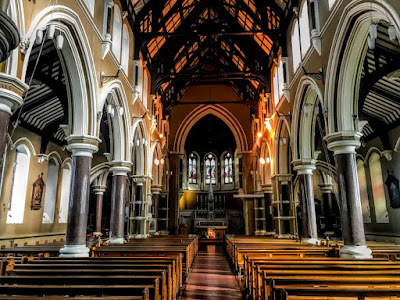 In the 19th century, there were at least two Church of Ireland churches, a Quaker meeting house, a Methodist chapel and a number of churches attached to religious orders. At the end of the Victorian era, Saint Michael’s, the Roman Catholic parish church built on South Street in 1804-1806, no longer seemed to be adequate or elegant enough for the Catholic professional classes and merchants of the old borough, and they decided to build a new church that would not only rival the other churches in the town but would also equal Saint Aidan’s Cathedral by AWN Pugin in Enniscorthy and the newly-built parish churches in Wexford Town. The new parish church, the Church of Saint Mary and Saint Michael, which I visited on Friday [15 March 2019], was built at the junction of Robert Street and Cross Street (originally Cross Lane) in 1894-1902. 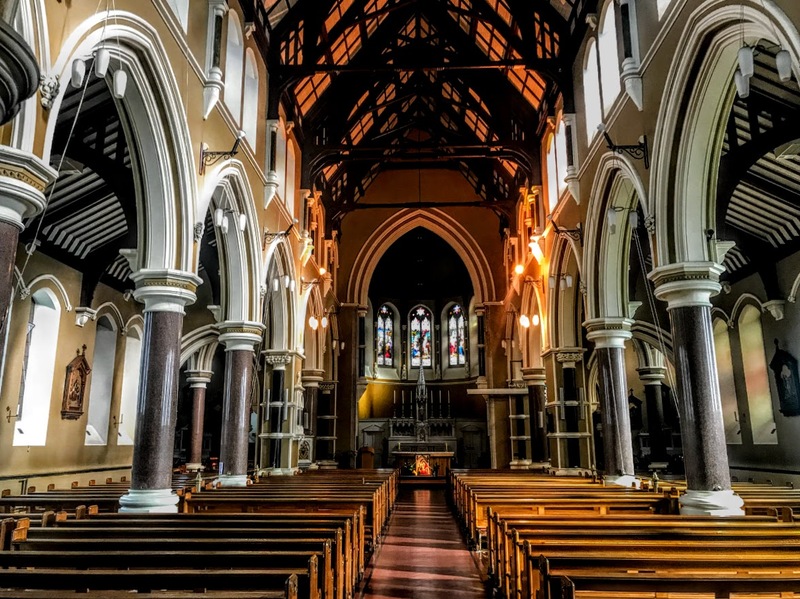 This church, built on old Franciscan foundation, was designed in 1894 by the architect Walter Glynn Doolin (1850-1902) in the Early English style, and with a capacity to seat 1,200 people. 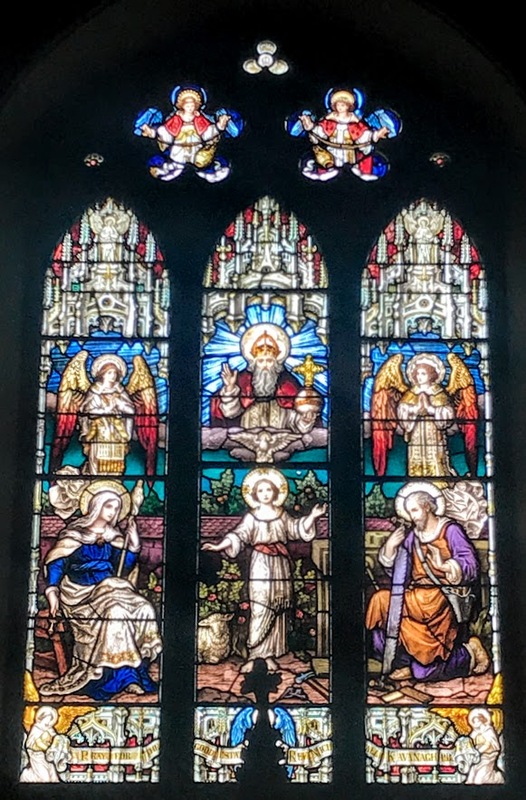 A tablet to the memory of the Right Revd Michael Kavanagh (1840-1915), Parish Priest of New Ross and Dean of Ferns, says ‘this beautiful church’ is ‘the enduring monument of his genius and his zeal for the glory of God’ of its builder. However, in truth, the church is the very antithesis of Dean Kavanagh’s grand ambitions. His original proposal was for a thrifty ‘improvement’ or rebuilding of the then parish church, Saint Michael’s Chapel on South Street. However, his proposals were ruled out by a parish committee that coveted a church to rival those in Enniscorthy and Wexford Town. Kavanagh negotiated four potential sites for a new church with the landlords of New Ross, the Tottenham family, but the parish committee selected his least preferred site, and over-ruled his preference for a Romanesque style church, selecting instead an architect who was a steadfast advocate of the Gothic Revival. WG Doolin was born in Dublin, the son of William Doolin of 204 Brunswick Street and his wife Anne Eliza (Glynn). He was educated at Tullabeg College, Castleknock College and Trinity College, Dublin, where he received a BA and a Licentiate in Engineering. 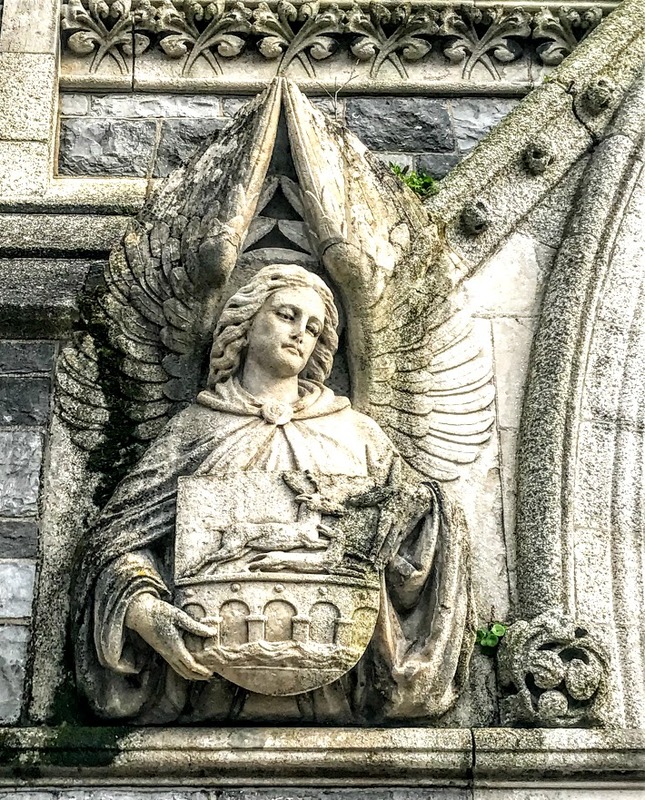 He received his architectural training with his father and in the office of John Joseph O’Callaghan, and later worked in London in the Architects’ Department of the School Board and the office of William Burges. He had returned to Dublin by the beginning of 1872, when he was living in his father’s house at 204 Great Brunswick Street. By 1875, WG Doolin had offices at 204 Brunswick Street in Dublin and in Waterford. He later worked from 20 Ely Place and 12 Dawson Street, Dublin, and 2 Beresford Street, Waterford. In 1874, he designed a theatre in Waterford, and he then received a number of commissions in the area, particularly in the Roman Catholic Diocese of Cashel. He was regarded as ‘a competent classical scholar, a ripe student of English and foreign literature … and in all that pertained to the arts and sciences a thinker of no mean originality.’ He died at his home, 11 Pembroke Road, Dublin, on 10 March 1902, aged 52, and was buried in Glasnevin Cemetery. His wife, Marion (Creedon) died in 1930. The principal source of information about Doolin is Gearoid Crookes, ‘The Career and Architectural Works of Walter G Doolin (1850-1902),’ unpublished MA thesis, UCD (1987). The foundation stone of Doolin’s church was laid on 29 September 1895. It was built by Andrew Cullen of New Ross at a cost of £25,000, and the church was completed in 1902. The church was opened by Bishop Browne of Ferns that year, and the preacher at the opening ceremony was the Jesuit Father Conmee. 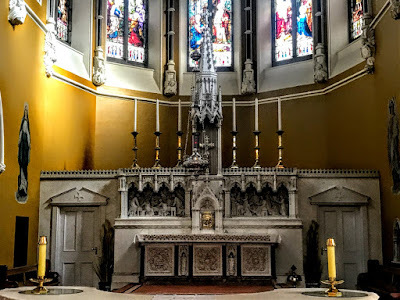 The interior includes a pipe organ by Telford and Sons; side altars dating from 1901 by Edmund Sharp (1853-1930) of Dublin; a ‘flèche’-topped high altar (1901) by James Pearse (1839-1900), the Birmingham sculptor who was father of the brothers Patrick and William Pearse, leaders of the 1916 Easter Rising in Dublin; stained glass by Mayer and Company of Munich and London; and an exposed hammer-beam timber roof. The carving throughout the church and the external sculptures are the work of John Aloysius O’Connell of Cork. The church has many similarities with the churches Doolin designed around the same time Nenagh, Co Tipperary (1892-1906), and Castlebar, Co Mayo (1897-1901), sharing features as the cruciform plan form, aligned along a liturgically-correct axis. 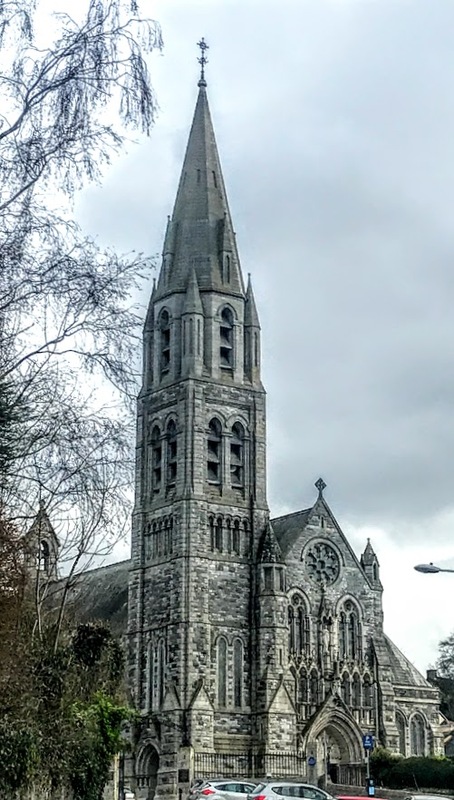 The slender profile of the coupled openings underpinning a mediaeval Gothic theme, with the polygonal apse defined by cusped East Windows, and the turreted spire embellishing the tower make this church a prominent feature in New Ross. This is an eight-bay, double-height Catholic church, designed on a cruciform plan, with a five-bay, double-height nave opening into five-bay, single-storey lean-to side aisles. There are single-bay, two-bay deep, double-height, double-pile transepts centred on a single-bay, double-height apse at the crossing on a projecting polygonal plan. The church has a single-bay, six-stage tower built on a square plan and supporting an octagonal spire. The details of the church include cut-granite coping to the gables on gabled ‘Hollow’ kneelers with Celtic Cross finials to the apexes, a cut-granite gabled bellcote at the apex framing a cast-bronze bell, cut-granite ‘Cavetto’ corbels, stepped buttresses, paired lancet windows in the clerestories and side aisles, lancet windows in tripartite arrangements in the transepts, pointed-arch windows in the apse, a pair of shouldered square-headed door openings at the west front in a pointed-arch recess, mosaic tiled cut-granite steps, a pair of pointed-arch windows, and a Rose Window. Inside, the church has a full-height interior open into the roof with a pointed-arch tripartite arcade at the west end supporting the arcaded choir gallery with a timber panelled pipe organ (1902). The pointed-arch arcades have polished Aberdeen granite pillars with hood mouldings on foliate label stops. 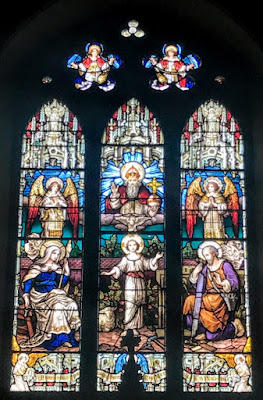 There is an exposed hammer-beam timber roof, a ‘flèche’-topped, cut-veined white marble high altar below stained-glass memorial windows (1899), stained glass memorial windows (1899), and Gothic-style timber Stations of the Cross. The church was well maintained, although both the exterior and the interior were reordered in line with the liturgical reforms introduced by the Second Vatican Council (1962-1965). Nevertheless, it remains one of the important Gothic Revival churches that decorate the landscape of Co Wexford.